For the messaging loving Android users Motorola will soon to release PRO+ 4G handset, equipped with Android 2.3 Gingerbread OS inside you have lots of things to do with the new QWERTY handset. It also has a 3.1-inch 640 X 480 pixel scratch resistant touchscreen. A 1 GHz CPU certainly helps you to do all the demanding jobs like quick browsing or hd video playing. Motorola PRO+ 4G will be available on Canada, exclusively to Bell from 7th November. We don’t hard anything about the pricing yet from Bell or Motorola. Read the press release for details. TORONTO – Oct. 25, 2011 – Life is full of demands, and we all could use a little extra help. With the sleek and sophisticated Motorola PRO+ 4G, brought to you by Motorola Mobility Canada Ltd. and available soon with Bell on the best network across Canada, you can have your own personal assistant that fits right in your pocket. Motorola PRO+ 4G gives you the power to edit important documents on the go, multitask when every second counts and encrypt sensitive work information with enterprise-level security so your IT manager can sleep at night. This supreme blend of touch screen, full QWERTY keyboard and Android™ 2.3 (Gingerbread) makes this smartphone ready for anything. Motorola PRO+ 4G has a super quick 1GHz processor and physical QWERTY keyboard for more efficient typing and texting when you need to update a client on the fly, browse for news and really important information, or multitask as necessity demands. And, with quick group messaging, it’s easy to reach an entire list of people in no time at all. The device is also packed with productivity features to make your life easier and to help you impress your boss including the pre-loaded QuickOffice® Connect for accessing, creating and editing documents on-the-go. We know that in a fast paced world, going in and out of apps wastes precious time, so now key apps such as your calendar and email are scrollable direct from your home screen. Motorola PRO+ 4G is a smartphone that you and your IT department can agree upon. Nothing says business ready better than the leading security features; whether it’s remote wipe of your device and SD card, password expiration and history, or full encryption, your IT manager will breathe a sigh of relief. Motorola PRO+ 4G comes loaded with 25 Exchange ActiveSync security policies – including PIN lock, auto-discovery of Exchange Servers, Extended Device Management API’s and 3LM integration. Your sensitive information – your career – is guarded in this virtual vault with Motorola PRO+ 4G. It’s fully loaded with support for Exchange and GmailTM for business, including corporate directory options. With these leading features your IT manager just might give you a smile. Motorola PRO+ 4G merges all of your personal and business information for you in a convenient system designed to make your life easier. Take the pressure off knowing Motorola PRO+4G syncs services from multiple sources, so all your contacts are viewable the way you want them, calendar options are available to arrange, edit, and respond to meeting invites, there are direct dial conference options, and intuitive email solutions that can anticipate who you may be sending an email to before you do. Its 4G Mobile HotSpot capabilities enable you to connect multiple devices, such as a laptop or tablet, for quick access to the Web, corporate email and calendar syncing. Plus, it features scratch resistant Corning® Gorilla® Glass so tossing your phone in your bag or pocket doesn’t have to be a disaster. Motorola PRO+4G is ready for full customization to bring you the games and applications most important to you. With Music, Motorola’s unique music player you have a dashboard for music discovery. You have easy access to all your favourite artists and song lyrics. Plus, you receive live, personalized recommendations for songs and videos as well as news and event updates from the world of music. With Gallery, you can aggregate all your photos from social networking and photo sharing sites like Facebook and PicasaTM for easy viewing. Plus, with Adobe® Flash® Player 10.3, you’ll be able to access the online content you love. Motorola PRO+4G is also preloaded with the latest Google MobileTM Services including Google Maps™ 5.0 with Navigation, Google Talk™ and more than 250,000 apps from Android Market™. A suite of smart accessories ensures users get the most from the Motorola Pro+4G. Available accessories include a Bluetooth® enabled headset, Bluetooth enabled car kit, portable power, and car charger. The Motorola Pro+ 4G will be available November 7 exclusively from Bell. For more information visit Motorola.com. 1All talk and standby times are quoted in Digital Mode, and are approximate. Battery performance depends on network configuration, signal strength, operating temperature, features selected, and voice, data and other application usage patterns. 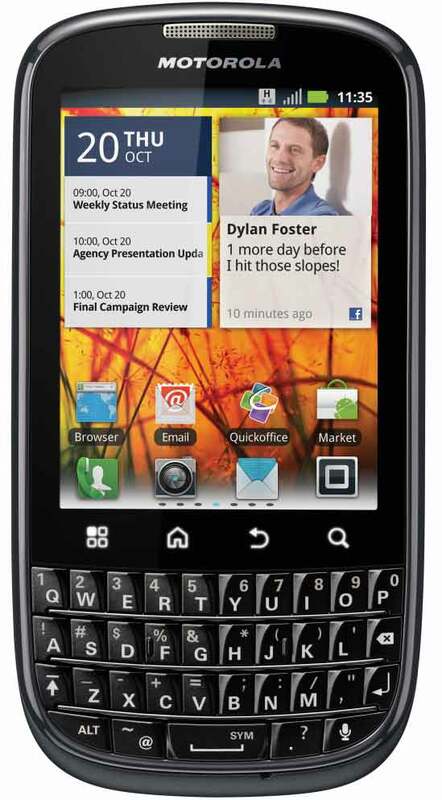 Motorola Mobility and the Stylized M Logo are trademarks or registered trademarks of Motorola Trademark Holdings, LLC. Facebook is a registered trademark of Facebook, Inc. Android, Gmail, Picassa, Google Mobile, Google Maps, Google Talk, and Android Market are trademarks of Google, Inc. All other product or service names are the property of their respective owners. © 2011 Motorola Mobility, Inc. All rights reserved.